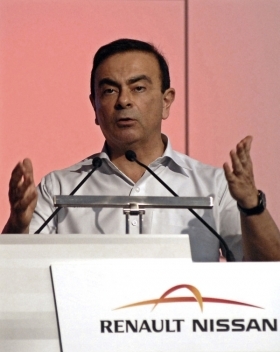 Renault CEO Carlos Ghosn plans "more realsitic" strategic targets for the French automaker. PARIS (Reuters) -- Renault SA will discuss its new strategic plan and annual results at board meetings on Jan. 31 and Feb. 9, sources said. "The two dates are in the diary," a source close to the company said. "I don't see how we could discuss the results without talking about the strategic plan, or talk about the plan without discussing the results." A second source confirmed that board meetings would be held on the two dates. Renault confirmed that a board meeting would take place on Jan. 31 but declined to say what was on the agenda and would not confirm the Feb. 9 meeting. The French carmaker is due to unveil the strategic plan on Feb. 10 when it publishes its full-year results. The plan is set to focus heavily on electric vehicles, in which Renault and alliance partner Nissan are jointly investing 4 billion euros ($5.31 billion), as well as synergies between the partners and growth in emerging markets as car demand in Europe stagnates. The company had to drop its previous strategic plan, which aimed for a 6 percent operating margin in 2009 after the crisis threw the automobile industry into turmoil from late 2008. Renault CEO Carlos Ghosn, who is also head of Nissan, has said the new plan for Renault would include "more realistic" targets and promised a detailed plan for the coming year with longer-term perspectives. "The plan will be very number-focused for a given period but after there will be qualitative content to clearly indicate the direction we're taking," he said at October's Paris auto show.